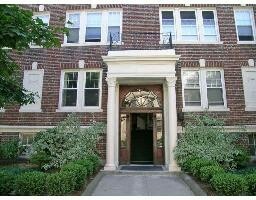 Lovely Coolidge Corner condo! Bright & breezy 5 rm, top floor condo w/striking oversized foyer, offers fabulous layout & flow. Fine pre-war details, treehouse-like rear porch, 2bds, storage galore, EIK w/gas stove, walk-in pantry, fresh paint, refinished floors, high ceilings. Roof rights for private deck, high owner occupancy. Steps to MBTA "B"&"C" lines, Boston U, dining, shops, parks, more! 3 mo's prepaid rental parking, $150/mo-next to condo. Pets welcome! Motivated seller - bring offers ! !